Vacation Barefoot Travel Blog: Cat Island in the Bahamas - a monastery and mermaids! Cat Island in the Bahamas - a monastery and mermaids! I bet you didn't know that there's a monastery in the Bahamas. Typically you think of monasteries being on high mountain tops in cold countries. 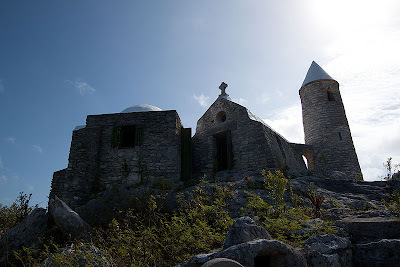 But in the island chain of the Bahamas there is one monastery, on top of Mount Alvernia on Cat Island. At 206 feet above sea level, Mount Alvernia is the countries highest peak. And on that peak sits The Hermitiage, which was built by a reclusive Father Jerome, an architect and Catholic priest. Today you can visit the grounds for a great view and relaxation. On the North part of the island is a lake with a supposed mermaid! It's a 10 foot deep lake called Mermaid Hole and it's believed that a mermaid lives amongst 4 blue holes within the lake. Blue Holes are all over the Bahamas. They are natural pools that connect with the ocean through underground, limestone tunnels. Cat Island, Google Map, is a 150 square foot island that has a total population of 1,678. Wow what a great post.i am impressed from it.